Indian Bow root is an elegant perennial native to the eastern U. S.. 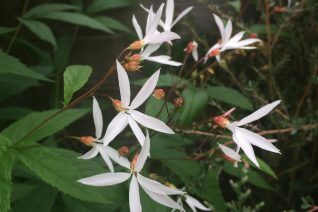 Finely divided handsome leaves rise up on 3 stems that support a myriad of small delicate pure white flowers in May/June. The foliage remains handsome following bloom and in autumn turns raspberry red and holding before falling down. Slowly increasing clumps in rich soil with regular summer moisture. Full sun to quite a bit of high overhead shade. Long lived carefree perennial. Extremely cold hardy. Winter deciduous.